Download this page as a .pdf document (you will be asked for your email address). The Maypole Dance is often done as part of a performance so an element of display might be appropriate. For example, the dancers might form into a circle around the maypole and then, when the music starts, move forwards to collect their ribbon. The step to use for music based on jigs or reels is a lilting walk or skip. For hornpipe rhythms use a step-hop-step-hop alternating from one foot to the other. For waltz-time music, take 3 even paces for each waltz bar of music. 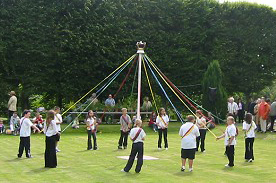 In its most simple form, the dancers simply stand in a circle around the maypole and, in time with the music, take 4 steps towards the maypole, 4 steps back and the circle for a count of 8. As they approach the maypole they can raise their arms, and then lower them as they back away. The next level of complexity is for the dancers to attach ribbons to the top of the maypole. 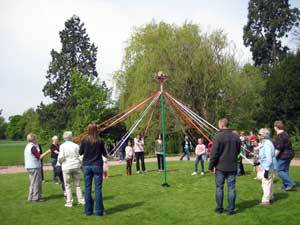 Most maypoles have a static (non-rotating) crown so the ribbons plait onto the maypole as the dancers circle around. This is called a closed plait. Dances where the ribbons plait away from the maypole, such as The Gypsies' Tent, are called open plaits. To get used to using the ribbons, make sure that all the dancers are facing in the same direction and holding their ribbon in their right hands. The left hand simply gathers up the excess ribbon. Now start the music and all dance around the maypole in the same direction without overtaking. Eventually there is no length of ribbon left as it has become wrapped around the maypole, at which time the order is given to reverse your steps and unwind the maypole. If you unwind without any knots you have successfully completed your first plaiting dance. The next dance requires you to divide into 2 groups of equal numbers. Members of Team A should partner Members of Team B. 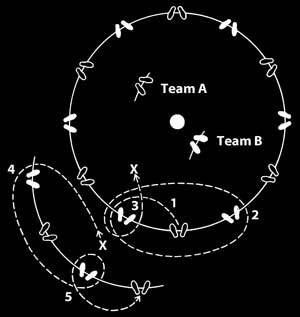 Make sure that As and Bs are spaced alternately around the maypole with each Team A dancer facing one from Team B and then start the music. Each of Team A should pass right shoulder with their first Team B dancer and then left with the next (do not turn back on yourself), carrying on alternately until the ribbons are again exhausted. As dancers pass each other, they should raise and lower their right arm rhythmically to guide the ribbon over the other dancer. To unwind, remember to retrace your steps accurately, passing your last dancer first and then alternate shoulders until the ribbons unwind. Make sure that everyone dances at a constant pace and that no one overtakes. You have now completed your second ribbon dance. You can vary the dance by having pairs (or more) of dancers, joined arm-in-arm, weave in each direction together. In each case, look at the beautiful pattern that you have made on the maypole during the dance. 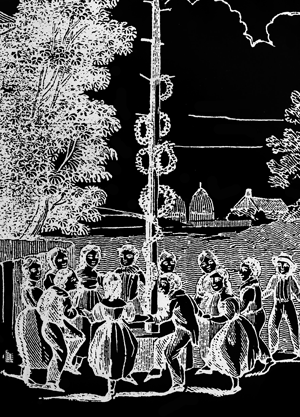 In this dance you will make a web or tent that builds from the top of the maypole outwards away from the pole (an open plait). Each Team A dancer stands beside their Team B partner. When the music starts, Team B stands still and their Team A partner dances around them and then weaves to the right around the next Team B dancer, then back again round their own partner, then on to the Team B dancer to the left, and finally back to their own partner. To unwind, simply reverse the moves. See picture. There are many variants of this dance, with each team taking a turn to move or with one team passing two of the other team before dancing around them. You can easily experiment but remember that the goal is to be able to unwind cleanly after you have used up all of the ribbons during the wind up.